Chocolate Stout Cupcakes with Irish Cream Buttercream…..Slainte!! It’s that time of the year again. When you see tons of postings in honor of St. Paddy’s Day. Green colored beer and desserts, shamrocks galore, corn beef recipes, Guinness braised meats, and more! As for me, I went all out last year with our Guinness Chocolate Cupcakes with a Baileys Ganache. I kind of went overboard with them. They literally SCREAMED St. Paddy’s Day with a decadent Guinness Beer cupcake, filled with a chocolate truffle, with spirals of green Baileys buttercream, topped with shamrock sprinkles and wrapped up in a bright green striped cupcake liner. PHEW! Now that is St. Paddy’s! Those cuppies were decadently delicious and I wanted to bring them back for this year’s St. Paddy’s Day — but a little more “understated”. I went for the same moist, stout beer cupcakes and Irish cream flavored buttercream—-however, this time around I opted out of the truffle centers and put away my green food coloring. No need….their yumminess speaks for itself. I chose a simple large round tip to pipe the frosting this time– a Wilton 1A. But as “understated” as I was trying to keep things, I could not resist breaking out the shamrock sprinkles. After all, I don’t get to use them very often — and who couldn’t use a little more luck? So whether you want to go BIG with the GREEN theme or be a little more subtle, Chocolate Stout Cupcakes are definitely the way to celebrate St. Patrick’s Day! And with that dear Friends, SLAINTE!!! Preheat oven to 350°F. Line cupcake cups with paper liners. Prepare the cupcakes: Put the butter with the stout beer in a sauce pan over medium heat and bring to a simmer. Whisk in cocoa powder until smooth. Cool slightly. In a large bowl, whisk the flour, sugar, baking soda and salt. In a mixer bowl, beat the eggs and the sour cream together. Add the beer/butter/cocoa mixture and beat to combine. Add the flour mixture and beat briefly just to combine. Using a rubber spatula, fold the batter until completely combined, making sure to incorporate little pockets of flour on the bottom so that the batter is of equal consistency everywhere. Fill the cupcake liners about 2/3 of the way if you want flatter cupcakes and 3/4 if you want domed. Bake for about 17 minutes, or until a toothpick inserted into the middle of a cupcake comes out clean. Cool completely to room temperature. Prepare the frosting: In a large mixer bowl, whip the butter for several minutes until very light and fluffy. Slowly add about half of the powdered sugar a few spoonfuls at a time until incorporated. Slowly drizzle the Irish Cream and whip until combined. Add the rest of the powdered sugar until your desired consistency has been achieved. Assemble: Fill a pastry bag and pipe buttercream on top of cooled cupcakes. Garnish with sprinkles or other adornments. Enjoy! Note: This makes a lot of buttercream so that you can pipe large mounds on the cupcakes. If you prefer less on your cuppies, halve the amounts. These look so cute! 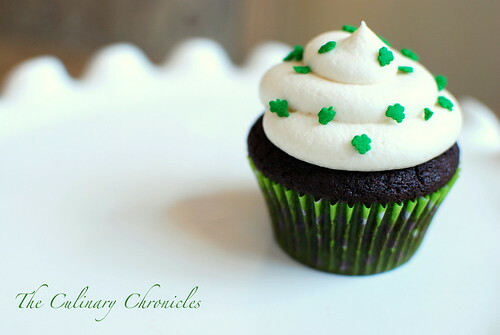 I am planning on making guiness chocolate cupcakes for St. Patty’s day also. I love your cute decorations. Thanks so much JL! 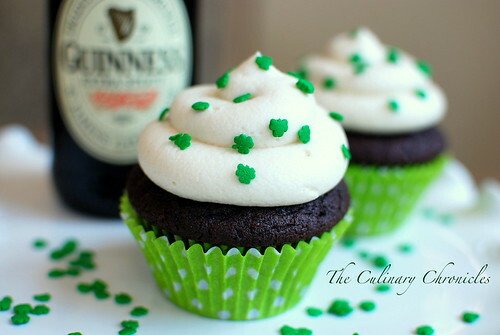 Guinness Cupcakes just seem to go hand in hand with St. Paddy’s Day! These look fabulous! I was on the look out for a St. Patty’s Day alcohol themed dessert to make for my hubby and his man friends on St. Patty’s Day and these look perfect! I do have one question though, you list that the buttercream calls for “2 Cup” of unsalted butter. Do you mean 2 sticks? 2 cups seems like an awful lot of butter. These look absolutely awesome. Had I not given up sweets for Lent, they would so be happening in my kitchen next week! Great recipe. Looks totally awesome. You should post it on http://www.tasteimonials.com too. They are new and don’t deny your submissions for lighting or composition. Check it out. They’re great. be part of the start up. Thanks Laurel! I will def. head on over to check it out! Mmmmm I can’t wait to try that! Thanks for inspiration. You’re very welcome and thanks for stopping by! I love the photo with the mini baileys! These cupcakes look and sound great! Seriously- so cute! Thanks Lindsey! I opted to buy mini baileys bc having the regular sized bottle in my fridge would be waaaaay too tempting! You’re on a roll!! ‘Grats on making it on Cupcakes Take the Cake again! Those shamrock sprinkles are an awesome touch! Beautiful cupcakes!! I noticed that you used two liners for the cupcakes in order to showcase the full beauty of the final product. If you use greaseproof paper liners, the grease would not soak through. Just a thought! Great job on this!! Beautiful photography too!. These were supposed to be greaseproof liners so you can imagine my disappointment when they came out of the oven like this 😦 No worries, boozy cupcakes makes up for it–lol! Pingback: Looking Good in Green « Does it Have Booze in it? How adorable and delish. Congrats on the top 9 today! Congrats on the top 9!! Of all the pics on the foodbuzz top 9, yours caught my eye first. It is such a lovely picture. AND oh my, YUM!!! Using my favorite beer in a cupcake, well best idea ever!!! I plan on making these for St. Patrick’s Day next week but I don’t have the shamrock sprinkles. I do, however, have the same cupcake liners you used. Any ideas as to what I can garnish with? I was thinking chocolate shavings or maybe mini peppermint patties… but not sure if the taste would go. Any ideas? I can’t wait to make these! If you want more whimsical, definitely candies! Green M&Ms or even those little chocolates filled with alcohol—the sky is the limit! These look and sound sooo yummy! If only I weren’t (always) on a diet! Maybe I’ll halve the recipe and make just a small layer cake for the hubby and me. These are too cute…and congrats on top 9! I was just thinking that I wanna try some chocolate stout cupcakes for St. Paddy’s…I’ve always wanted to but never have….and Bailey’s frosting?!? Hello, delicious! You really did a beautiful job!! Really, a very Happy St Patricks Day to you. Those sprinkles are adorbs! And the recipe looks good too! I’ve been eyeing it over at Smitten all week! Your cup cake not just look delicious but it is very cute. 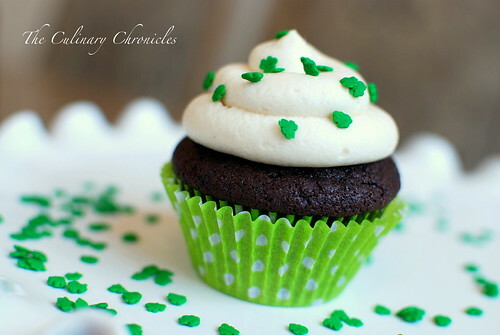 It is a pity that hee where I live they do not celebrate St. Patrick’s day, because those cupcake are the besy gift. Lovely and inviting cupcakes. Congrats on top 9 ! These look awesome! I’ve never had the chocolate with the stout, but it sounds delicious, so I think I might actually try them! The girls @ work will love me, ’cause whenever I bake, I try to get it out of the house as fast as possible! I brought these into work last year and was deemed the “favorite” person of the day! lol—I’m sure it will be the same for you! I can’t think if a better dessert for St Patty’s Day! 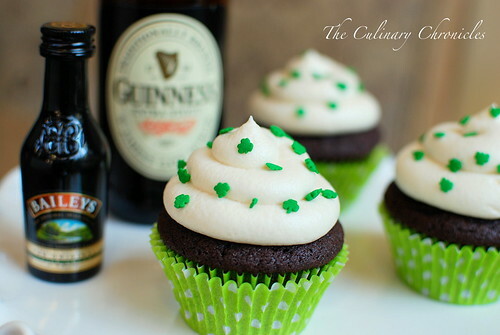 Love the idea of using Guinness in a cupcake! I made these cupcakes last night. The flavor was amazing! But….I live in a high altitude area and did not adjust the recipe. For anyone else in high altitude be sure to add a little bit of extra flour. Although they tasted great, the cupcakes caved in the middle. How much extra flour should be used? Also I read elsewhere to decrease the amount of baking soda to 1/2 tsp? Just curious…do the cupcakes taste at all like Guinness? I’m not a beer fan, and I am wondering how much flavor remains after baking. Would kids like these, minus the alcohol in the frosting? Hi Suzanne, these cupcakes do have a slight “Stout Beer” flavor to them–lightly bitter and nutty. I actually like them more for their moistness since I think the Guinness flavor is so light. Gluten Chocolate Stout cuppies sounds like a WINNING idea! These look fantastic! I was thinking of making them into mini cupcakes…any ideas as to how to adapt the cook temp/time? Thanks! These are currently in the oven and will be frosted tomorrow (going to use a cream cheese/buttercream Irish Cream frosting) – check me out later in the week to see how it goes! In order to make washing dishes easier I “finger-cleaned” the mixing bowl… WOW, that batter is delicious and I just cannot wait to have the finished product! I made these yesterday, and they were absolutely delicious. I made the regular sized cupcakes and some minis (cut the bake time to about 10 to 12 min.). Thanks so much for a great recipe! I, too, made them yesterday! They were a huge hit!! I brought them in to the restaurant I work at and my boss asked me to start making cupcakes for a house dessert! Crazy!! 🙂 thanks for the recipe to follow… I knew I wanted to make stout cake with Irish cream frosting, but had never made ” from scratch” cuppies!!! It was so easy! No more boxes for me!!! Thanks! These were so yummy (past tense since they are all gone now)! I was a bit confused by the runny butter/beer/cocoa mixture, but it all turned out fine. I brought them to work today and my boss thought they were great!! It was my first time making cupcakes from scratch and now I’m afraid I’ll never go back to box mix, ha. They turned out fluffy and flavorful — and they weren’t difficult to make at all (easy-to-follow directions, of course!). I did have the same problem as one of your other readers, though…the cupcakes caved in a little…and I’m not in high altitude. I saw that a recommendation was to add more flour — how much exactly would you advise? If you’re not in high altitude it sounds like it could be a result of two things. It’s possible that the cupcakes were undercooked a tad and sunk as a result. Since oven temps vary (despite what it says), always use a toothpick to test for “doneness” in the center of a few of your cakes to determine if they’re fully baked. I also have an oven thermometer that I picked up for a few dollars to see how my oven registers. The second possible reason why cupcakes sink is that the liners may have been a tad overfilled with batter. I stick closer to 2/3 and definitely not over 3/4. Definitely going to make these!! thanks! I’m going to try this recipe on my friends wedding it sounds really good and we ( the wedding party ) are really exited to try it! I love the look of these cupcakes! But u have a question, could i substitute amaretto for baileys? Do you think it would come out ok? I am wanting to make a chocolate stout cupcake, with an amaretto buttercream, with a shot glass filled with malibu. My idea of an alcoholic almond joy. Do you think it would turn out ok? Thats funny that you say that about the almond extract because that was my plan. I think I might do the Baileys cream instead of the Amaretto. I cant decide which one I wanna do now. :p …. So how do I get a smooth but thicker buttercream without adding a tons of powdered sugar? I don’t want it to be crazy sweet. For the buttercream you really need to sift the confectioner sugar to get all the lumps out and it will also leave the sugar quite fluffy. When you add in the confectioner sugar, do it slowly by adding a few spoonfuls at a time ensuring that it’s well incorporated before adding the next few spoonfuls. Also, be sure to have the butter at room temperature. I find that these few steps really decrease the need for adding a ton of sugar and will leave the texture to be wonderfully smooth. Good luck! So I made it last night and it has a really strong butter flavor. Is that normal, I don’t remember the frosting I’ve made before being that buttery. I also did not sift the sugar, I know, I know… I intended to but my room mate broke my sifter and I didnt know what else to do. UGH! The partys tomorrow and Im freakn out! The cake I made last year was awesome, I want this one to be better! Hi Krystal! The frosting shouldn’t have a really strong flavor—especially since you are flavoring it with a liqueur. Is it unsalted butter? If you’re up for trying a different type of buttercream, check out my most recent post on a swiss meringue buttercream. It yields a lovely, light texture. Yep, I used unsalted butter.. THESE ARE GLORIOUS, THANK YOU. I used Guinness Extra Stout instead of the regular, and it ended up pretty fabulous. I made these cupcakes tonight but they totally sunk in and then spilled over the liners. I think for me, next time, I will have to reduce the baking soda by half or possibly add a half cup more flour to the batter. Super recipe, thanks for posting! Nice ! I made these for St. Pats day for the nurses under my wifes employ at the nursing home, they were gone in a flash ! Now thats a compliment ! I just like the valuable info you supply on your articles. I’ll bookmark your weblog and test once more here regularly. I’m reasonably sure I will learn lots of new stuff right here! Good luck for the following! Pingback: Celebrating our Irish roots: Chocolate Stout Cupcakes with Bailey’s Buttercream Frosting | McChens!